Jennifer A couple of weeks ago, Joe and I went to a concert in a church in downtown Uppsala. My office mate S. sings in the Uppsala Kammarkör, and he sold me a couple of tickets to their performance on 6 April. 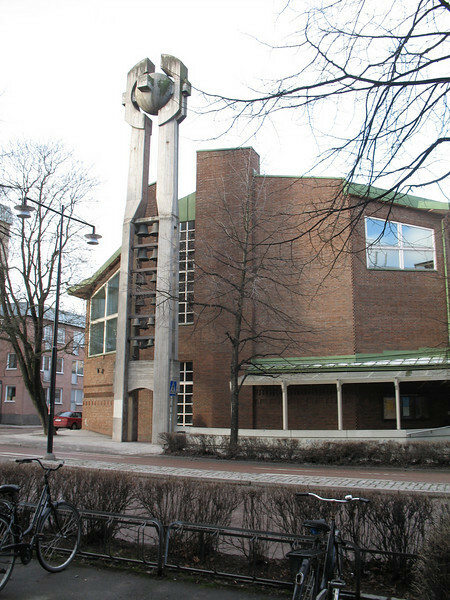 The church is an Uppsala landmark, appearing on tourist maps and brochures. It is not, however, one of the classic old churches that are found here and there in town. The first time we saw the building, we both assumed that it was built by communists some time in the early 1960s, and we dubbed it "Our Lady of the Secret Police." There's just something vaguely East German about it, to my eyes. 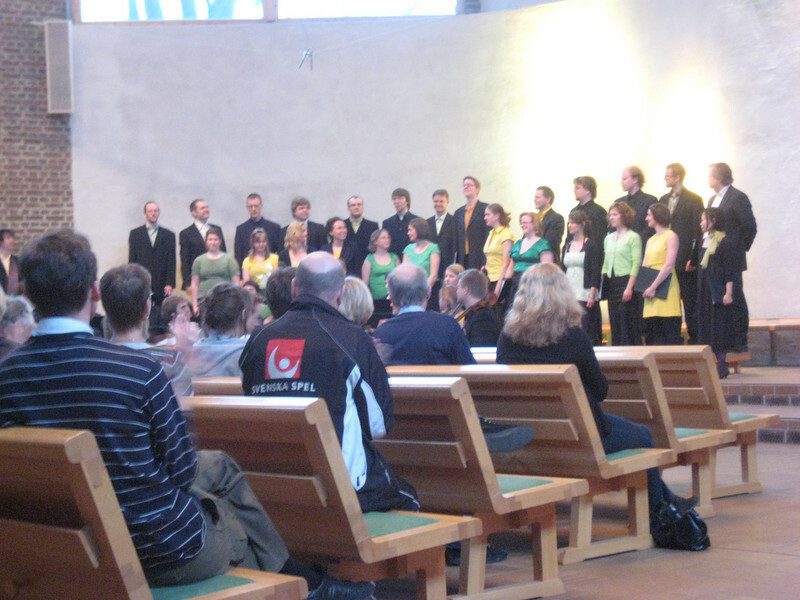 The 30-voice choir was joined by an 18-piece orchestra for the concert, in which they sang Mozart's Sparvmässan and Kröningsmassan, both i C-dur. I don't think I have ever heard (or even heard of) the Sparvmässan before hearing it at this concert (S. told me he had never heard of it either, until they were handed the sheet music). The program says that not much is known about this piece other than that it was first performed on Easter in 1776 in Salzburg's cathedral. It is a fine piece with some interesting tempo changes, not Mozart's best, perhaps, but perfectly lovely to listen to. The second piece I have heard before, of course, and the choir did a wonderful job with it. Their female soloist is excellent (S. later told me that she is also a scientist by day, working in the biomedical research center), and their voices filled the church so that you felt you could almost float on it. This feeling, of the air being saturated with sound, is something recorded music can never reproduce, no matter how good your speakers are. S. and I talked a little about the concert the following Monday, and about signing and music more generally. S. is a music buff, of course, and he also enjoys all types of music, and especially going to concerts. He is of the opinion that current technology makes the traditional recording industry obsolete, and he thinks that musicians are going to have to go back to earning their money the way they did in the old days—that is, from live performances. One popular stereotype about Swedes is that they all sing a lot, and I have no evidence to dispute this stereotype. I have been told that big parties like Disputationsfests almost always include some singing, both set performances and sing-alongs that include everyone, and I have the impression that the more formal the party, the more singing is expected. Fika talk has included discussions (and sometimes nearly arguments, which are not common here) about the Eurovision song contest (last mentioned here). And when music is discussed at fika, people do not hesitate to sing a bar or two of something aloud, to jog someone else's memory. S. even asked me if I were interested in singing in the choir, as they need some more people for their spring and summer concert plans. I, err, demurred. I will need to spend a lot more time breathing the air of Sweden before my voice is anything close to those that I've heard so far!